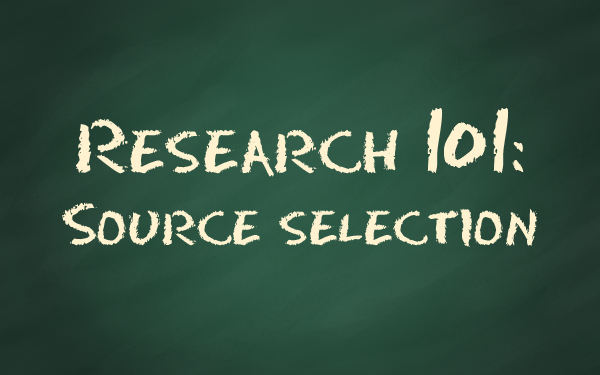 In this edition of Research 101, we are going to look at the importance of source selection in secondary market research. Source selection is crucial to secondary research because it provides the context to information and the researchers conclusions. First, lets define secondary research. Secondary sources refers to research that has already been collected and interpreted by others, including government agencies and trade associations. Secondary research is typically general in nature. Secondary research sources are very popular among researchers as they are inexpensive and help form preliminary hypothesis that might often lead to primary research. Primary research is focused and specific collected specifically engineered to answer a researcher’s question. For example, secondary research will tell you how much money consumers spent on watches, but not how much they’re willing to pay for the particular watch design your company has in mind. That would be a question answered only by primary research. Primary and secondary research are most effective when used in tandem. Secondary research lays the groundwork, while primary research fills in the gaps. Now, a little advice on selecting sources for your secondary research. There is more to gathering secondary sources than just finding on-topic information. Good researchers must take into account all the variables about the source in question, including date, publication, author, potential biases and validity of the research cited. Failure to consider these elements can lead to key strategy flaws as the research used to support your assertions are not as reliable as first believed. To help ensure that your research is reputable, ask yourself these questions before adding any source to your references page. 1. When was this research published? A good rule of thumb is that any information older than five years is probably no longer valid. It is also consider the date of important events when evaluating sources. For example, research published during the economic recession might have a very different conclusion than similar research conducted just prior to the economic decline. Most importantly, ensure that you are using the most recent data available. 2. Who is behind the research? While evaluating sources, it is important to be aware of the the people, companies and financial supporters of the research you might reference. Not only is this important to assess whether those parties are qualified, but also to identify any potential biases or ulterior motives in the data. For example, it might not be a good idea to cite gun statistics from a trade organization that opposes the Second Amendment. This conflict of interest might skew the results of the research. As researchers is important to do a little background research on the responsible parties to ensure the data is as objective as possible. 3. Where was the research published? The third variable to evaluate is where the research appeared. Knowing the publication, journal or website where the study originally appeared can either add to or detract from the information’s relevance and validity. That being said, it is easy to understand why research appearing in an academic journal might be considered more reliable than similar data originally published on a blog. In the case of source evaluation, the medium often a glimpse into the quality of the research. Academic journals have a rigorous peer-review process to ensure that the research published is credible. Stats you might see discover on a friend’s blog, however, might have lower standards. It might also be beneficial to consider the audience of the publications in which the research appears. This will help you, as a researcher, assess whether the data is applicable to the readers of your research.